What the heck is Sülze? 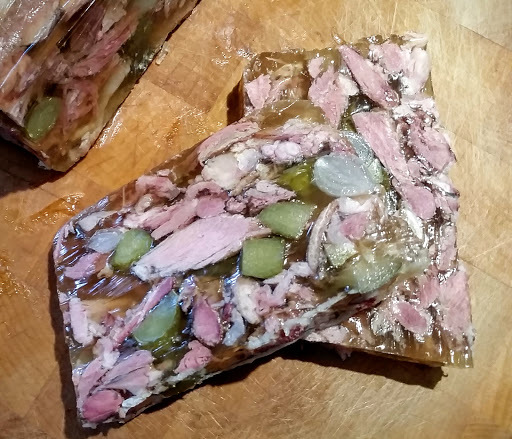 Sülze is a German style of head cheese where the gelatinous aspic has an acidic vinegary taste. 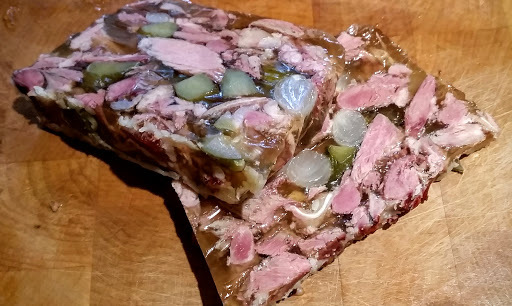 I know, I know, head cheese is one of those foods that makes some folks’ mouths water and makes others cringe in horror. Several years ago I was working in Europe. One week I was in Belgium, and the next week I was slated to be in the German Eifel region. Düsseldorf lies right in between. If you haven’t been to Düsseldorf, you’re missing a great place. The Altstadt of Düsseldorf is a pedestrian-only area. It was spared from bombing in World War II, so much of the old architecture is still in use. At one end of the Altstadt lies a big open air market with all sorts of produce, meats and bread. Within the Altstadt, there are six Altbier breweries. 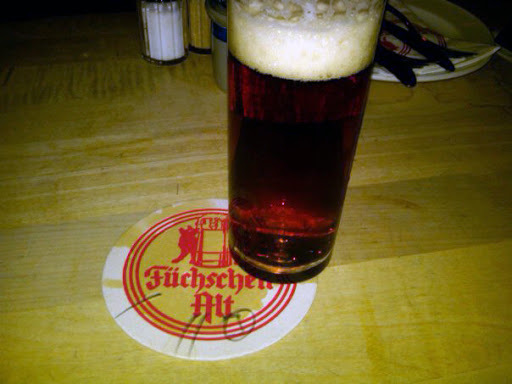 Altbier is a style of beer unique to Düsseldorf. It is a top fermenting beer that is brewed like a lager with cold aging. The beer is dark copper in color, richly malty, and assertively hopped with spicy noble hops such as Spalt. In these breweries, the beer is served in 0.3 liter straight sided glasses, and as long as you have a spot at a table, the server will keep a full glass in front of you. Naturally, they serve some delicious dishes to accompany the fine beer. On this European trip, I of course spent my weekend in Düsseldorf. A hotel by the market, and a nice look around there to see what was in season. Then around the corner for lunch at the closest brewery, which happened to be one of the best and most famous, Zum Űrige. The crowd was gathering there, but I squeezed into a table for lunch. 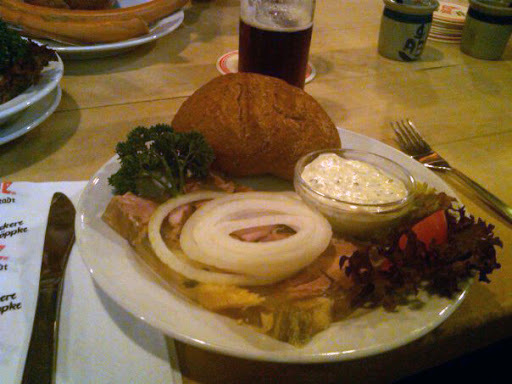 On the menu was Hausmacher Sülze. In German, it also read “just like your grandmother made.” Well, I had to have that. It was served with a hearty whole grain roll, slices of fresh onion, and a remoulade sauce. Delicious! 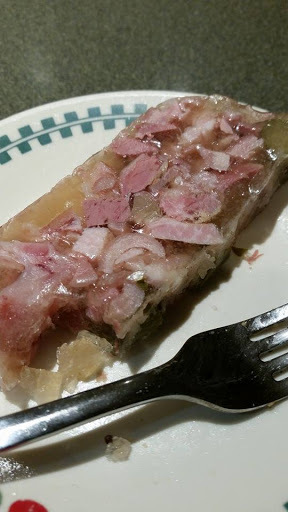 I loved the tangy flavor of the vinegary aspic. I wanted to learn to make this! I got home and found I didn’t need to make it. Nearby is the German Gourmet, and they have every type of German deli item you can think of, and then some. Of course, they have Sülze. It is very good, but I still wanted to make it myself and see what improvements I could make to it. I’ve made it a few times since, and what I have made today is the result of what I think makes a Hausmacher Sülze that I am proud to serve. Maybe my grandmother would not have made it, but I bet she would love it. First thing to find is a pig’s head. Well, I have made it without a whole pig’s head before, using jowls, tongue, and feet, but traditionally, it starts with a head. I happened to have a pig head that I removed from a pig I roasted earlier in the year. I would have cooked the pig whole, but it did not fit in the fridge with the head and feet still attached. So, I removed them and saved them to make this dish. Combine the salt, sugar, and pink salt with 2 gallons water. Heat until all is dissolved. Cool. 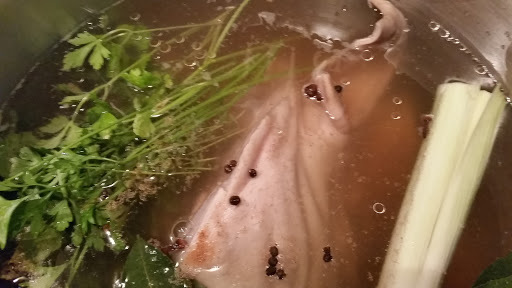 Add the pig head and feet to the brine and refrigerate overnight. The next day, rinse the head and feet and place in a large pot. Add the wine, vinegar, and fill with water until the head is submerged. Add the beef bones, peppercorns, bay leaves, leek, garlic, thyme, parsley, nutmeg, cloves, and coriander. Bring to a good simmer. Simmer covered until the meat is falling off the head. This may take 4-5 hours. Take the meats out of the pot and place in a large bowl or platter to cool. Strain the stock, and return to pot. Continue to simmer the pot to reduce the stock. Remove some of the stock to a small bowl and place in the fridge to check if it gels. When the meats are cooled to handle, remove all meat from the head and feet and place into a separate bowl. I use the tongue and ears, but do not use the brain. The tongue has a skin that will peel off. Place the bowl of meat in the fridge. If the chilled stock does not set, then add the gelatin to a pint of cool water to soften. Once softened, then add to the hot stock and allow to cool slightly. Line a ceramic loaf pan or large terrine with plastic wrap. Place a layer of meat on the bottom of the pan. Sprinkle with 1/3 each of the onions and cornichons. Repeat the process 3 times until you run out of meat. Ladle the stock over the meats to cover. Place the loaf in the fridge to set. Allow to chill and set overnight. The next day, remove from fridge and slice about ½ inch (1 cm) thick to serve. I like to serve with crusty bread, mustard, and a slice of sweet onion. Goes great with a Düsseldorfer Altbier beer, too.